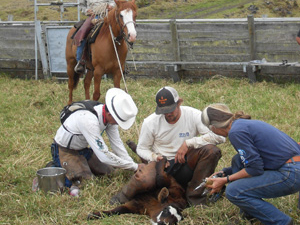 Kealia Ranch is a 12,000 acre working cattle ranch located on the Big Island of Hawaii in South Kona. Founded in 1915, by L.L. McCandless, the Ranch has a rich paniolo (cowboy) heritage. Today, Kealia Ranch is involved in various diverse activities from ranching to wild game hunting, farming of cacao and coffee, to working to save endangered Hawaiian birdlife. The historic cowboy office has been converted into a country store specializing in local crafts and provisions. 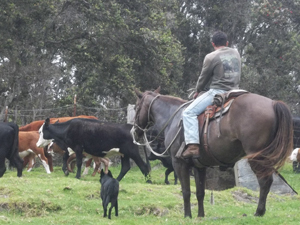 Stretching from the shores of the Pacific Ocean to the high slopes of Mauna Loa, Kealia Ranch is a working cattle ranch, with a cow/calf and grass finishing operation stocking Hereford/Angus cattle. We market locally as Kealia Ranch Grass Fed Beef and through the Hawaii Cattle Producers Cooperative Association as Hawaii Ranchers Natural Beef. We are third-party certified for humane and sustainable practices and believe the health of the land is what good stewardship is all about. Kealia Ranch headquarters at 1,000 feet offer the beautiful sights of mango, kukui nut, ulu (breadfruit), coffee, guava, and papaya. As you ascend into the rugged mountain forest the temperature cools and the Hapu’u (tree fern) and native Ohia appear. 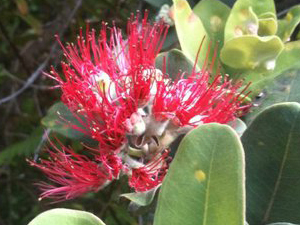 The regal monarchs of the Hawaiian woods, Acacia Koa, are found at 3,500 feet and continue intermixed with Sandalwood and Ohia until you reach sheep country at 6,500 feet.